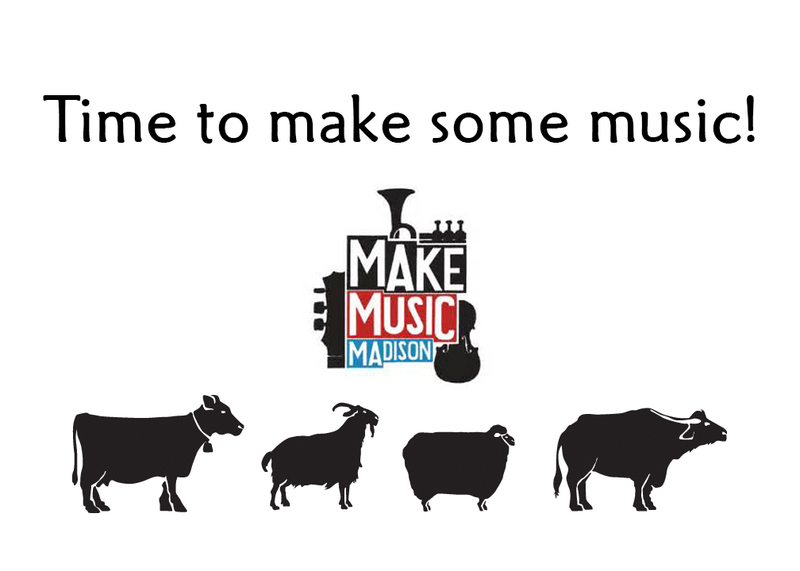 Wednesday, June 21, 2017 – the Summer Solstice – brings Make Music Madison back to South Carroll Street. Fromagination has participated each year since the international day of music came to our city. We’ve had beautiful music…and lots of fun…during that time. This year Fromagination has six musicians/bands, all of whom should be “a good listen” out on our outdoor patio! We have music scheduled from 10:00 a.m. until 5:30 p.m., just before we close. Traditional Frequency kicks off our day with traditional Irish, Scottish, and other instrumental folk music from around the world. Next, Jason Moon, a veteran and singer/songwriter who has played at Fromagination the last two years, is up. Jason was the 2016 Wisconsin Area Music Industry (WAMI) Singer/Songwriter of the year winner. At noon, Josh Cohen, a music educator based in Toronto, Canada, plays a 6-string electric bass to show off his his solo compositions and arrangements. Next arrives the No-Name Stringband, creates its own groove on light-footed and hard-driving barn dance tunes of the American south, then slowing down to explore more introspective original compositions. Later, Dave Cofell performs a variety of styles on six and twelve string guitar, from old standards to folk and blues songs, instrumental banjo tunes, jazzy novelty songs, R&B to covers. He has performed by invitation for the American Folk Life Center for the Library of Congress. Finally, the last of the afternoon, Polimorphic displays elements of jazz along with a steady pulse of classic blues over a foundation of a classic 90s alternative rock sound. Come and hear some music…and celebrate the beginning of summer!